Have you ever experienced having sore gums whereby your gums feel swollen or painful? Ever notice having red, white or black gums? 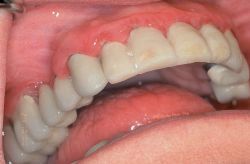 The gums can be sore or pigmented for a number of reasons and this article is to discuss about the many factors behind it. The article will be split into parts according to common complaints for easy reading. Is spontaneous in onset with a moderate to severe intensity in pain and usually persists for long periods of time (hours). Is aggravated by biting of teeth. In some cases, the tooth feels “high” or like it is coming out and is very sensitive to touch. Has often been followed by pain in the pulp and usually associated with a dead tooth. May be associated with swelling of the face or sometimes connected with fever or body discomfort. Lateral periodontal abscess is a localized collection of pus surrounded by inflamed tissue located on the gums at the side the tooth. The pain is similar to that of acute periapical periodontitis, though less severe and with swelling and redness of the gums. 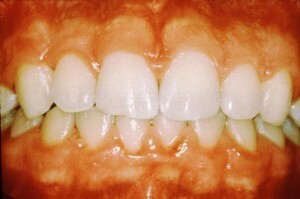 The swelling is usually located more gingivally compared to an acute periapical case. Tooth ache is felt on tapping of the affected tooth and is often mobile and slightly extruded. The gums have deep pockets and the tooth pulp is usually living. 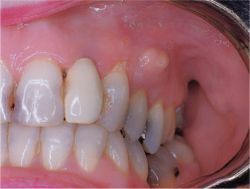 Pericoronitis is the inflammation of the flaps of gum tissue covering incompletely erupted teeth (operculum), particularly the lower third molars. Pain is spontaneous and is often aggravated by closing the mouth. In some severe cases, pain may be worsened by swallowing and there may be difficulty in closing the mouth. Occasionally pericoronitis may be accompanied by fever, swelling in the neck and body discomfort. The affected operculum is acutely inflamed, red and swollen. Frequently, an opposing upper tooth may cause ulcers on the swollen operculum. Soreness and pain. In the early stages some may complain of a feeling of tightness around the teeth. 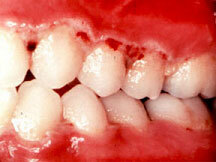 Pain that develops between or in two adjacent teeth after meals, especially if the food is fibrous for example, meat. Pain associated with feeling of pressure and discomfort which may gradually disappear until you chew again. Ulcers and erosions can be the final common manifestation of a spectrum of conditions like systemic diseases, cancer, trauma, burns, drugs and for unknown reasons in persons who are otherwise well (aphthous ulcer). Ulcers can appear in a single or multiple lesions and could be persistent, indicating that it may be caused by a chronic condition. Topical steroids and anti-septic mouthwash are useful in the management of many oral ulcerative conditions. If you have any of the above symptoms, it is wise to have your gums checked by your dentist to treat the underlying cause. Pain is the most important symptom suggestive of oral disease but each individual’s response to pain varies. It is important to identify and treat the cause of pain when possible, relieve factors that could lower the response to pain (tiredness, anxiety and depression) and to avoid taking anti-pain drugs without prescription. Always remember to maintain a good oral hygiene to prevent the occurrence of problems in your mouth. Have swollen gums and lumps? Red, white or pigmented gums? Read more about the various causes for them here and here.